Special Containment Procedures: SCP-2402-1 through 3 2 are to be kept in a locked standard storage drawer at Site-17. All requests for testing or other purposes must be logged, with digital copies of the date, time, person requesting access, and reason for requisition kept at three separate facilities. Logs must be cross-referenced at least once monthly for discrepancies. All testing with SCP-2402 instances must take place in soundproof testing chambers constructed no later than 1996. If soundproofing foam is found to be worn or decaying, testing may be allowed to continue with specific permission and increased protection from the principal researcher or site director. Care must be taken to use speakers with enough age to survive testing. Description: SCP-2402 is a chord progression in the normal range of hearing for humans. The specific frequencies for each note involved and the length of each note in succession are listed in Document 2402-KS [REQUIRES 4/2402 CLEARANCE]. The chord progression causes an anomalous harmonic vibration within subatomic particles, causing a reversion of particles to a prior oscillation with lower entropy. Rapid shifting of subatomic oscillations to previously exhibited states effect a temporal reversal in the exposed materials. In organic materials this reduction in entropy is generally observed to consist of the recomposition of cells and tissues. For example, a rotting fruit will return to an edible state. Living plants and animals will appear to become younger, with no corresponding temporal shift in the environment outside the listening area. The rate and intensity of temporal reversal is dependent on the strength of exposure. Sound pressure levels of at least 40 dB are necessary for the anomalous nature of the progression to become clear. The anti-entropic effects of the progression cease for any item moved to a range where the amplitude of SCP-2402 is less than 40dB, but accumulated temporal reversions remain in place afterwards. Test subjects and test materials have been observed to become younger at a rate of 6 months per minute of exposure at 70 dB. Analysis of brain scans and interviews of subjects after testing have demonstrated that the mind also reverts to an earlier time, removing all memories accumulated over the "rewound" period. Researchers are advised that extreme fear and confusion are common reactions to test subjects immediately after testing, as they will not remember why they were in the testing chamber, remembering only events up to their new, previous chronological age. Should subjects revert back to earlier than the adult state, the subject will decrease in mass, with the balance expelled as undifferentiated viable tissue. Test materials also experience entropy removal, resulting in reduction of wear and fractures. Recent construction of buildings can potentially result in disassembly of exposed rooms upon reversion to the date of construction, via the refilling of nail holes in wood, reversal of welds, and re-separation of concrete binding materials. Ensure that testing chambers are never exposed to a cumulative level of regression past their date of construction. Because of this property, older facilities in need of repair can be used as testing chambers, as long as the principal researcher has determined limited propagation of acoustic properties beyond the confines of the chamber. SCP-2402-1, -2, and -3 are the objects in containment which carry recorded forms of SCP-2402. 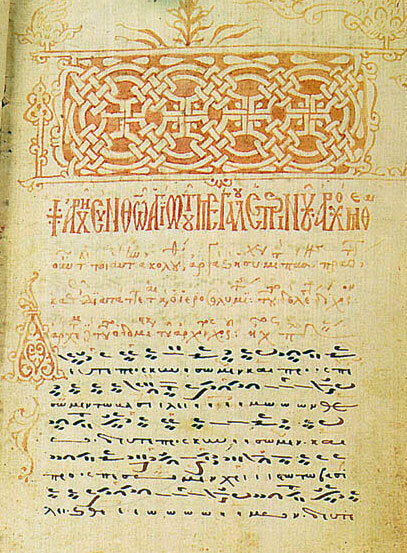 SCP-2402-1 is a musical manuscript using Byzantine notation. SCP-2402-2 is the file pureyouth.mkv, kept on a single 64GB thumb drive. SCP-2402-3 is [DATA EXPUNGED] Testing with SCP-2402-1 is restricted until Foundation musicians who have memorized the score have aged sufficiently to remember the score upon conclusion of play. Please refer to Personnel Roster 2402-1-09X for a list of Level 2/2402 clearance musicians, and date of memorization of SCP-2402-1. During testing, copies of SCP-2402-1 can be made available to musicians only if they are properly aged for a minimum of 7.5 years via SCP-119 before play. Regular testing of SCP-2402's effects is to be performed with SCP-2402-2, which can be played to speakers physically separated from the computer hosting the file. MTF Eta-11 ("Savage Beasts") was dispatched to the village of ██████, Bulgaria, to investigate rumors of the locals offering "a song that restores youth and virginity" for a considerable price. A number of musicians in the village were identified as persons of interest and surveillance was established. MTF members posed as paying clients and were able to infiltrate operations, and asked to join the musicians in a nearby cave in the Balkan Mountains. Average age of the musicians was approximated as 45-50, although the youngest (POI-2402-4, approximately 25 years of age) informed Agent Zhao that he has played the song longer than anyone else, and soon he would not be able to play it anymore. Zhao effected payment for "3 years of youth" and allowed to remain in the cave while the musicians played. The remaining members of MTF Eta-11 carried out a tactical assault [DATA EXPUNGED]. MTF confirmed the anomalous effects of the music through an examination of the regression of mole development on Zhao's skin and comparing them to medical records. SCP-2402-1 was recovered in the cave, along with 5 traditional Bulgarian instruments of recent make (gaida, kaval, tǔpan, 2 tamburas) and a recently made forgery of a Stradivarius violin. POI-2402-4 was the sole survivor of the encounter among the musicians, but was determined to no longer be a threat and left at the nearby monastery with a forged note claiming to be from his mother. The file pureyouth.mkv was located on a cloud server, having been uploaded by █████ ██████, a musician in New York City. It was sequestered and transferred to thumb drive and wiped from the internet, and Mr. ██████ was brought in for questioning. Upon interrogation, he revealed that he had no recollection regarding writing the music, and appeared to be suffering from retrograde amnesia, believing that the current date was six months earlier. Subject was given a Class B amnestic and released. I think what's going on is that you've got musicians who come up with this chord from time to time, but then while they're tinkering with it, they play it, they back up, and they can't remember ever having played it before. In many ways, it's self-containing, but now in the world of digital music, where something can be written out in a playable form without ever listening to it, first, there are more and more ways for files like this to end up in the public. Recovery Log, SCP-2402-3: An extraneous log entry in the database folder for SCP-1668 was found not to correspond with any item in containment for that designation or any other item in Foundation custody. The file consists of an item intake and testing log. File has been moved to SCP-2402 folder upon examination of contents and confirmation of anomalous effect by MTF Eta-11 member Mike Carter. Upon playing of entirety of album, subject reports hearing 2 minutes and 35 seconds of an unidentified movement played by symphony orchestra. Movement is described as atonal in the treble portion, but with a clear harmonic chord progression that are atypically somewhere between diminished and suspended in form. Unlike other instances of SCP-1668, the record does not include this movement. I fear I may have become lax in my presentation, but I am not quite sure how to classify my latest discovery. I had realized that a strict forward chronological progression led to a limited possible slate of results. Working in reverse, I discovered this haunting melody. I tried recreating it for the record, but a combination of the complexity of the piece along with its use of notes outside the chromatic scale made it impossible to duplicate. Perhaps you will have better luck. It does resemble something by Stravinsky or Shostakovich at first blush (if you will please excuse the conflation) and yet, I'm struck at how it almost fits with early opera, as if it were written by Jacopo Peri. I do know I have never heard it before. Yet something tells me I've heard it multiple times. MTF Zeta-4 Agent Mike Carter has listened to the album and generated an audio file that recreates the ideated music. Final testing of this phenomenon involves playing the audio file at the conclusion of vinyl record playback to confirm the music heard by test subjects. Researcher's Note: Agent Carter has no recollection of creating or playing the audio file. I also was no longer in Zeta-4 at the time. Don't know why I'd have been experimenting with sound files then. I know this is an unorthodox use of the database, but I need to do this for my peace of mind. Mike, and anyone else who might decide to join this old team, long in the tooth, I just need to make some notes on what happened in Garnya. Yes, we set up surveillance, we traveled out to Bulgaria, found the village, the musicians, let Zhao lead us into the mountains, all that. Beautiful place, Garnya. Seems lost in time. Took a while to make sure the Silencer was in place, we had recording equipment available, all that. We needed to capture the phenomenon. We had to be ready to make a snap call, rush in, stop the music, and pull everyone and everything out. I was supposed to be the lead on this. I'm deaf, so, it was figured, the anomaly wouldn't work on me. We didn't yet know it was acoustic, more physical in nature, and not some other method. But that's the risk we MTFs take every day, so, welcome. I ran in to stop the performance, got disoriented when I hit the sound pressure, the musicians saw me, the music stopped, and Zhao and I, not knowing what was happening, stuck to training and retreated. I needed a rebriefing on what happened. I completely forgot. Thank God we have the surveillance footage. That surveillance footage was key for myself and Zhao. It meant that we could try again. We kept the cave entrance guarded so the musicians couldn't escape. We couldn't wait any longer. We rushed in again. We rushed in five times. On the fourth run, I died. Well, I always let my anger get the best of me. I didn't check and the charges went off prematurely, collapsing the cave, with the musicians inside, and me, crushed under the rubble. Of course, the musicians just used the only weapon they had, that piece, and played it as loudly and fervently as they could. The wall of sound must have hit the rubble hard, because, according to the footage, the boulders pulled themselves back up into place in the walls, fixed themselves. The explosions imploded. And I just got back up and took down the charges and returned to base. Try not to catch yourself dying on camera. I thought losing my hearing was bad. As far as I'm concerned, one moment, I'm heading out of Garnya to the cave, and the next moment I'm being placed in front of a monitor, being told not to blow myself up again. All those events in the middle, there's nothing. Richards grabbed the Silencer and rushed in, guns blazing, moments later. Zhao told me the music had stopped. He came back out of the cave covered in some goopy, bloody film, I don't know what, with some sheet music and a baby. You want to know the weirdest thing? I've never heard the music. Duh, you're thinking, deaf guy. But no, from a temporal point of view, I've never heard the music. I've never been exposed. But when I dream, I do.